My name is Alexandria Aldinger. I am currently a student of Liberty Jr. Sr. High school of Tioga County, Pennsylvania. As a senior at Liberty, I was given the task of creating a senior project about my future occupation; a project required for me to graduate. In addition, we must also shadow someone for 20 hours in or related to the field we are pursuing, and document our experiences. The future occupation I have chosen is museum studies and art history (with a curatorial focus). I chose to pursue this career because I have an interest in both art and history. I love art. Learning the history behind art pieces makes it so much more interesting to me; which is why I think the field of museum studies and art history would make be a good fit for me. I was given the opportunity to be able to shadow two different employees at The Corning Museum of Glass; gallery educator Bonnie Wright, and curatorial assistant Kelley Elliott. This was very helpful for me because I was able to see two different jobs that make it possible for the Museum to operate successfully. Part of Bonnie’s job in the Educational Department is to prepare educational material for different uses and audiences. Bonnie explained to me a bit about marketing, editing, and advertising for the Museum. I observed Bonnie while she edited a page of the Museum’s website. I also was able to attend a Hot Glass Show which helped me understand how glass is formed and fashioned. During the Hot Glass Show there was a drawing to win a vase that was made by the gaffers, and just my luck, I won it! It was very interesting to watch and I would recommend that anyone who visits the Museum should attend a show. Bonnie also organizes some of the educational events for the Museum. For example, she organizes an event called Glass Camp. Glass Camp is a five day summer camp for children ages 9 through 11. I was able to help Bonnie go over the schedule for Glass Camp. Some of the activities for the children include gallery hunts, themed crafts, and attending Little Gather. Little Gather is a themed performance for children ages 3 and up that explores different types of glass through storytelling, puppet shows, music, and singing. Additionally, I observed Bonnie conducting one of several 3-hour training sessions for the Museum’s Explainer program. Explainers are teens and college students who are stationed throughout the Museum during the busy summer months, sharing information about the glass collection with visitors, and conducting youth tours. Bonnie was so helpful and full of information that I now am strongly considering becoming a museum educator. I also learned a lot while shadowing Kelley. I was able to visit the Museum’s warehouse where collection items not on display in the galleries are stored. While there, I helped Kelley and the registrars unpack a large shipment of Pyrex glass that was donated to the Museum. I also helped do some research for a public inquiry about a Pyrex glass hurricane lamp. 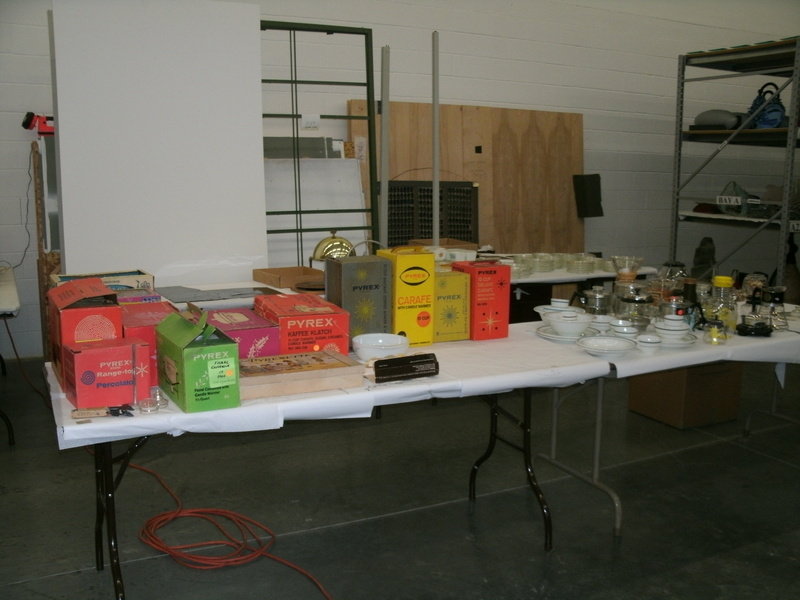 A table full of Pyrex glass at the warehouse waiting to be cataloged. 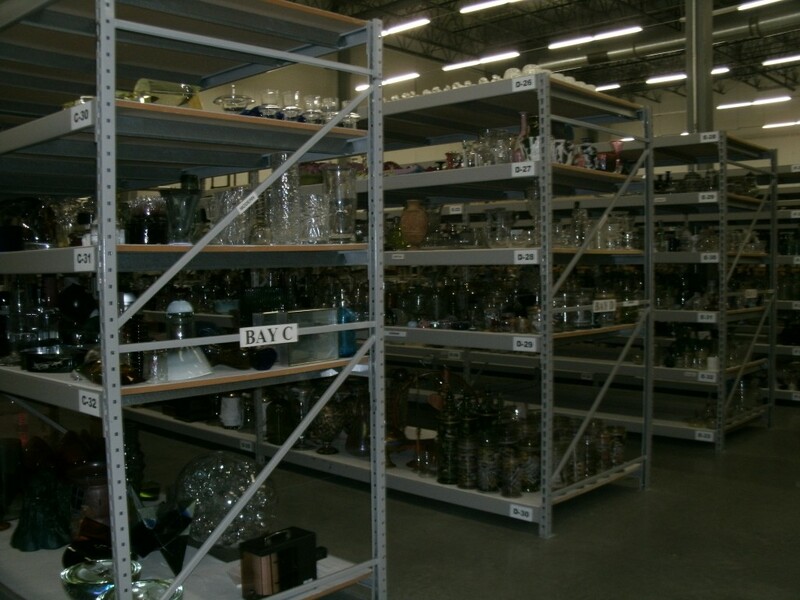 Shelves full of glass in The Corning Museum of Glass’ warehouse. Also while shadowing Kelley I was able to attend a meeting with designer Jon Otis at GlassLab, a design program at The Corning Museum of Glass. On July 17 and 18, Jon Otis created some design prototypes for the Museum. During our meeting we talked about which designs were successful, and we discussed the inspirations behind the designs. 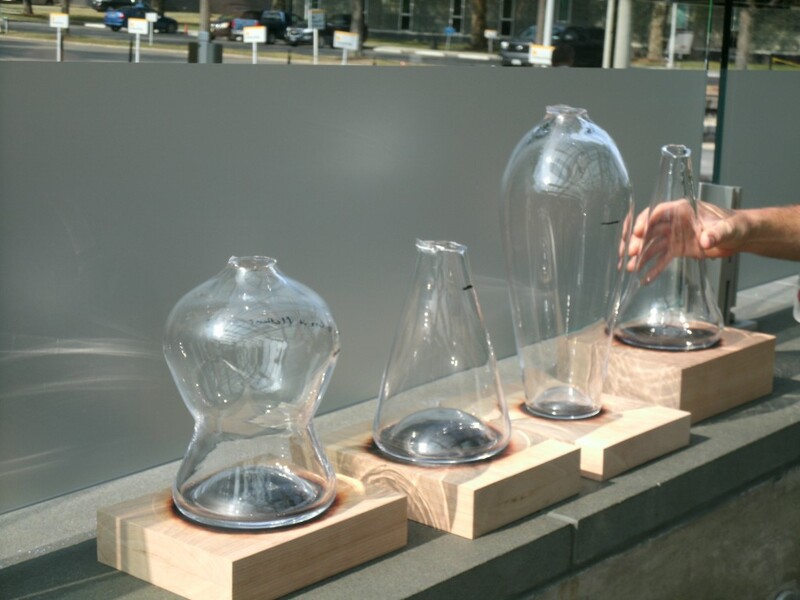 Some of Jon Otis’ design protoypes made at GlassLab. 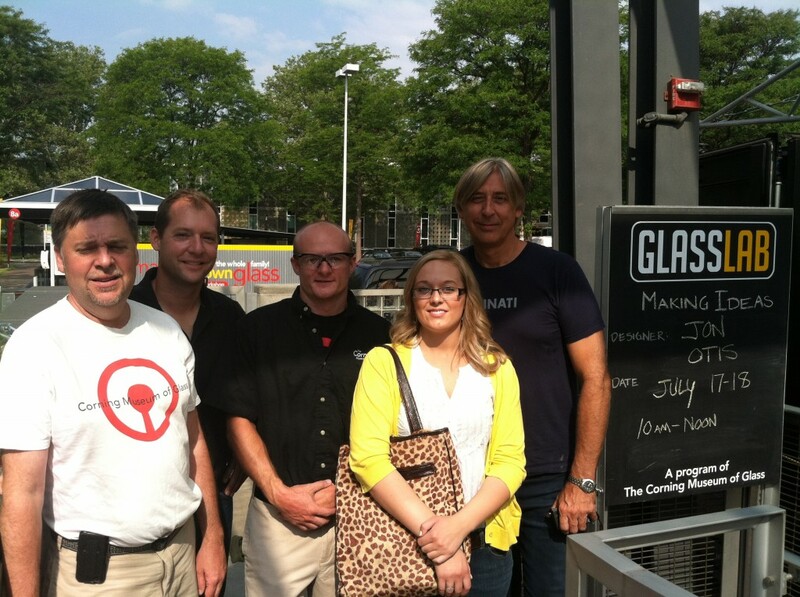 From right to left is GlassLab designer Jon Otis, me, G. Brian Juk (gaffer), Hot Glass Show supervisor Eric Meek, and hot glass programs manager Steve Gibbs, at The Corning Museum of Glass. I also helped Kelley with a research project on a glass vase by the famous French artist Émile Gallé (1846─1904). 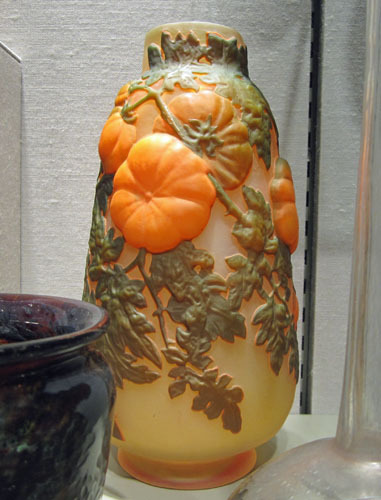 The vase, made sometime between 1890 and 1904, is called Vase with Tomatoes, but when looking at the vase it looks as though the tomatoes might be pumpkins because they are orange. We did research to find out if they were tomatoes or pumpkins. We researched the archives related to Gallé in the Museum’s Rakow Research Library. We found a photograph of a vase that looked very similar to the Vase with Tomatoes but there was no title on the photograph to indicate whether these were tomatoes or pumpkins. So we continued our research online by comparing pictures of the leaves of tomato plants to the leaves on pumpkin plants. We decided that the leaves looked more like those found on a tomato plant. 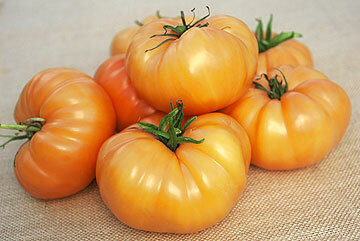 We also saw images of yellow and orange tomatoes with shapes very similar to what was on the vase. So we concluded that the piece by Gallé, Vase with Tomatoes, should keep its name based on what we found in our research. 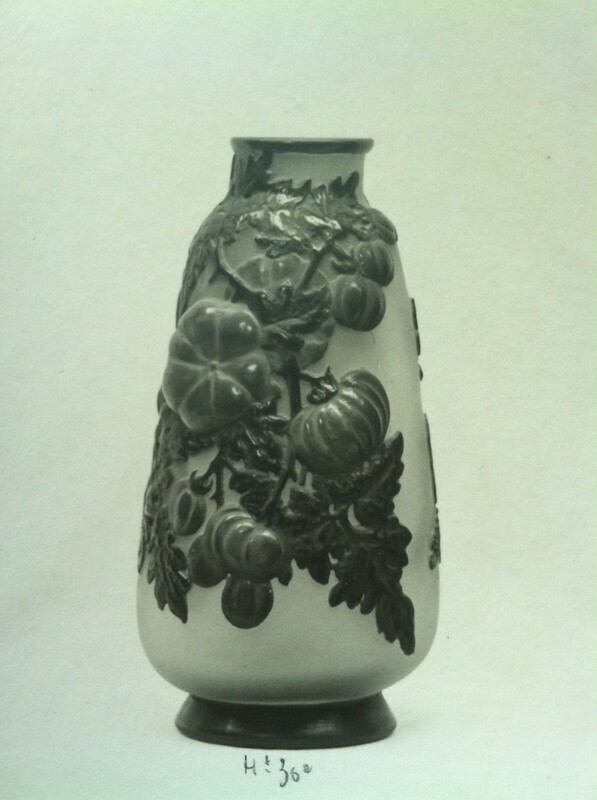 Photograph of a vase by Émile Gallé (1846─1904) similar to the Vase with Tomatoes. While at The Corning Museum of Glass I was also able to explore the Museum for myself. My favorite part was the Contemporary Gallery of the Museum. The word “contemporary” simply means of the present time (specifically it means made in the last 30 years). I am a huge fan of contemporary art. Overall my experience at The Corning Museum of Glass was amazing. The staff is wonderful and without them the Museum wouldn’t be as successful as it is. It was such a pleasure visiting the Museum for 20 hours and shadowing Kelley and Bonnie. It was definitely a great experience for me and I have memories I will never forget. I am looking forward to sharing my experiences and new knowledge of the field to my classmates and teachers this fall. I recommend The Corning Museum of Glass as a must visit on anyone’s vacation list.